In food processor, place sandwich cookies and pretzels. Cover; process until finely ground. Line cookie sheets with waxed paper. In large bowl, stir together cream cheese and peanut butter until blended. Stir in pretzel mixture. Shape mixture into 1-inch balls; place on cookie sheets. Melt candy melts as directed on package. Dip each ball in melted candy to coat; tap off excess. 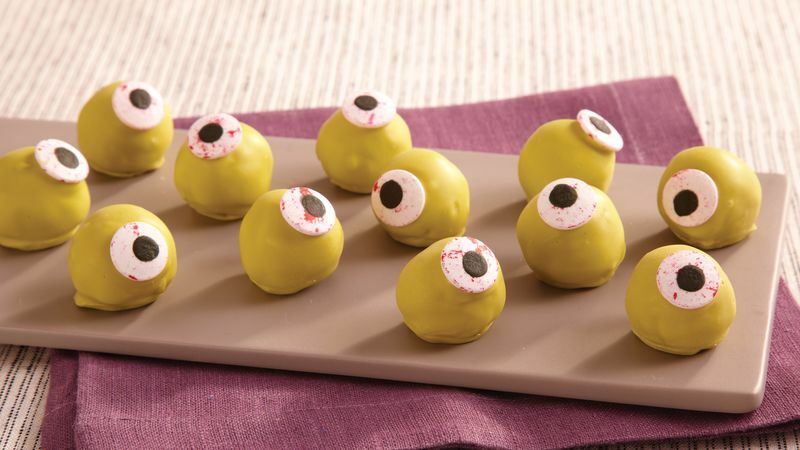 Attach 1 candy eye to each. Return to cookie sheets. Let stand until set. Store covered in refrigerator. To give the truffles more texture, use crunchy peanut butter.